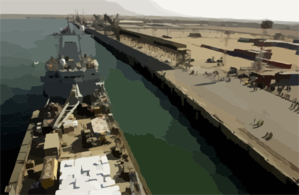 The Royal Fleet Auxiliary, Landing Ship Logistic Rfa Sir Galahad (l 3005) Arrives In The Iraqi Port City Of Umm Qasr Delivering The First Shipment Of Humanitarian Aid From Coalition Forces. The Royal Fleet Auxiliary, Landing Ship Logistic Rfa Sir Galahad (l 3005) Arrives In The Iraqi Port City And Delivers The First Shipment Of Humanitarian Aid From Coalition Forces. U.s. Navy Mine Counter Measures Ship Uss Dextrous (mcm 13) Patrols The Waters During Mine Clearing Operations In The Klawr Abd Allah (kaa) Waterway.